Stars: Colin Farrell, Danny De Vito, Michael Keaton, Eva Green, Nico Parker, Finley Hobbins, Roshan Seth, Alan Arkin, Joseph Gatt. Disney seems intent on producing live action versions of most of their classic animated tales. This live action remake of Dumbo follows other recent live action re-imaginings of classic Disney cartoons like Beauty And The Beast and The Jungle Book, with versions of Aladdin and The Lion King also on the road. Originally released in 1941, Dumbo was Disney’s fourth animated feature and one their most successful at that time. It told the story of an elephant that could fly. While the Disney animated film was perfect entertainment for the whole family, this live action version stretches the thin story out with lots of subplots, new narrative threads and some darker elements. Not to be unexpected since Dumbo is the work of Tim Burton (Beetlejuice, Batman, etc) and is full of many of his signature touches and quirky, idiosyncratic cinematic style and aesthetic. The film opens in 1919. The Medici Brothers Circus is travelling through America’s southern states. The circus is run by the flamboyant showman Max Medici (Danny De Vito), but in the immediate post-war years it is struggling financially. His former equestrian star performer Holt Farrier (Colin Farrell) returns from fighting in the war, minus his left arm. Medici has been forced to sell off his horses, but he hires Farrier as a general roustabout. Farrier is also reunited with his two children Milly (Nico Parker, Thandie Newton’s daughter, in her film debut) and Joe (Finley Hobbins), but he struggles initially to reconnect with them after his long absence. Farrier and his two children are assigned the task of caring for the circus’ heavily pregnant elephant. The calf is born with deformed, oversized ears. Medici hopes to exploit its unusual looks for curiosity value, but the ungainly looking baby elephant becomes something of a laughing stock. But then the children discover the elephant’s ability to fly with the aid of a feather. Before long the elephant, nicknamed Dumbo, is a success, and Medici’s fortunes have turned around. Then unscrupulous entrepreneur V A Vandevere (Michael Keaton) approaches Max with an offer too good to refuse. Soon Medici’s circus family is absorbed into Vandevere’s gargantuan Dreamland enterprise. Dreamland bears some surface similarities to Disneyland itself. But Milly and Joe soon discover there is a darker side to Vandevere’s operations. 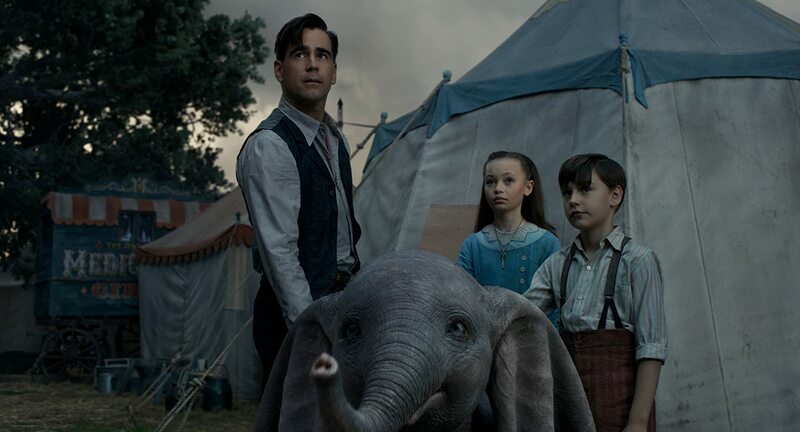 Dumbo is populated with many of Burton’s signature stylistic touches – eccentric characters, gargantuan sets, innovative production design, colourful sets, and a dark heart beneath the glossy surface. There are numerous references to the 1941 film sprinkled throughout, including the fire fighting scene, which here pulses with a genuine sense of danger, and a scene with pink bubble animals which mimics a similar sequence. This version has been written by Ehren Kruger (the man behind three of the Transformers movies, The Ring remakes and the thriller Arlington Road, etc) and is more of a re-imagining than a strict remake. This remake lacks the sense of innocence that drove the original as Kruger works in themes of family, the emotional damage caused by war, corporate greed, animal cruelty and exploitation. Some of the narrative threads are less successful here and the film appears unnecessarily bloated, stretching the original’s 64-minute running time to nearly two hours. Dumbo is depicted as a misfit that originally doesn’t fit in his world but soon finds his place, and this theme of the outsider will resonate with many in the audience. And Dumbo’s grief at being separated from his mother adds an emotional level to the screenplay that will hit home with many in the audience. Dumbo benefits from some cutting-edge CGI technology which has been used effectively to bring Dumbo to life and give him a winning personality that comes through the screen. Many of Burton’s regular collaborators also contribute to the visually stunning look of the film, from Oscar winner Rick Heinrich’s impressive and authentic looking production design which captures the era perfectly through to Oscar winning costume designer Colleen Attwood’s designs and Danny Elfman’s unusually saccharine score. The film has been beautifully shot by cinematographer Ben Davis (Guardians Of The Galaxy, etc). This is Keaton’s fourth film for Burton, and he brings a strange and vaguely sinister edge to his performance as the avaricious Vandevere. Farrell is good as the wounded Farrier trying to win back the love and respect of his children. De Vito brings energy and pathos to his performance as the crumpled, diminutive circus master, and he reveals several layers to the character. Eva Green is good as Collette, the high wire trapeze artist who develops a fondness for Dumbo and Farrier’s two children, but her role is underwritten. Alan Arkin is good and lends a sly humour to his role as a sarcastic banker. The two children are fine: at first they come across as a little tentative but they grow in confidence as the film progresses. It’s ironic to think that Burton, who once worked as an animator for Disney, was fired because his ideas were thought to be a bit too weird. Now he seems to be back in favour with the studio after his live action take on Alice In Wonderland was a huge hit at the box office. While uneven and darker in tone, his big budget special effects heavy remake of Dumbo does get a lot right, and there are a couple of spectacularly staged individual sequences that remain in the mind after the final credits. It will entertain certainly younger audiences who are unfamiliar with the original and have nothing to compare it with.